Nothing screams "party time" like a Bounce House Combo Rental! 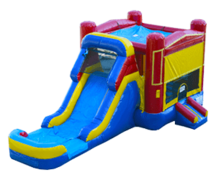 A classic party addition, a Bounce House Combo Rental invites guests to hop around in the large 15' by 15' play area, then make their way to the attachable slide, which features an inflatable pool at the end. This unit can be used wet or dry, making it ideal for hot summer parties and cold winter months alike. In addition to its striking blue, red, and yellow color scheme, the Bounce House Combo Rental also includes standard features such as a safety step, large mesh windows on all sides, and an outside hoop. Be sure to make your reservation in time for your party or event, and do not hesitate to reach out to us directly to learn more!